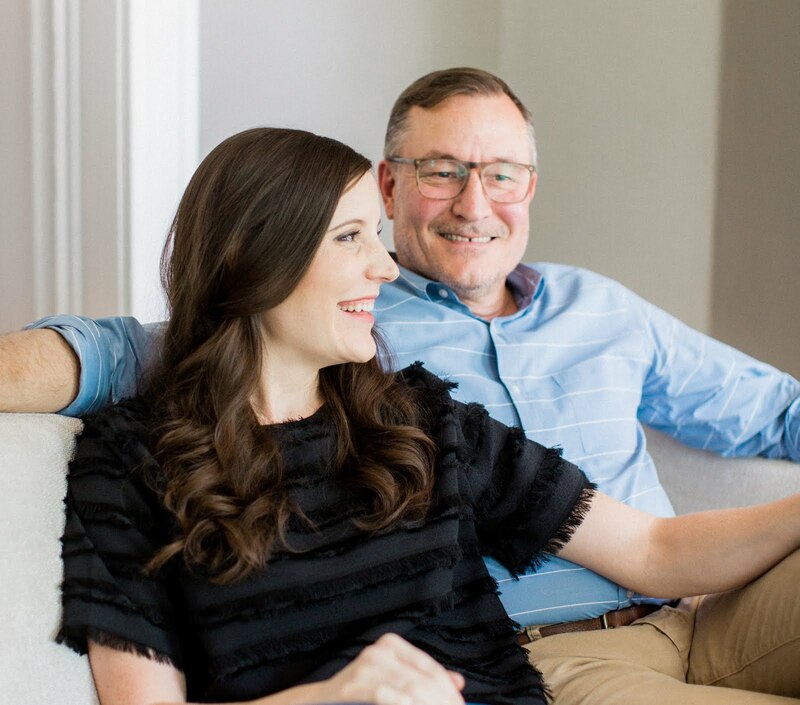 Tim and I have been frequenting our local markets for years now, loving every moment and we look forward to continuing. Each season that goes by we reiterate to one another how much we really need to go ahead and join a CSA. 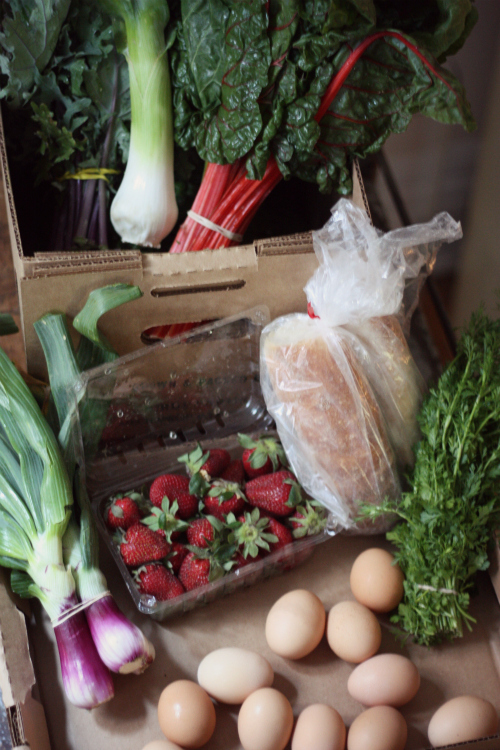 This is where The Farm Table Box comes into play — while not a traditional CSA in that all produce comes from one farm, this produce delivery concept supports multiple local farms and delivers fresh, sustainably grown food weekly. 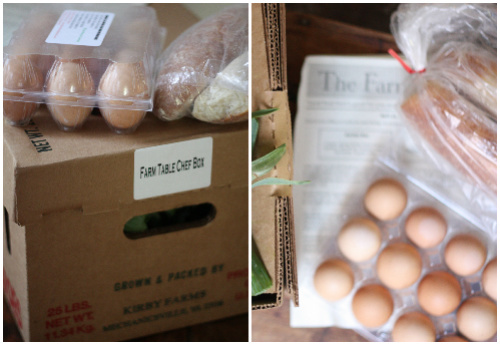 We love the flexibility of The Farm Table Box in that you can skip weeks you might be out of town or swap in different foods for others to suit your needs. 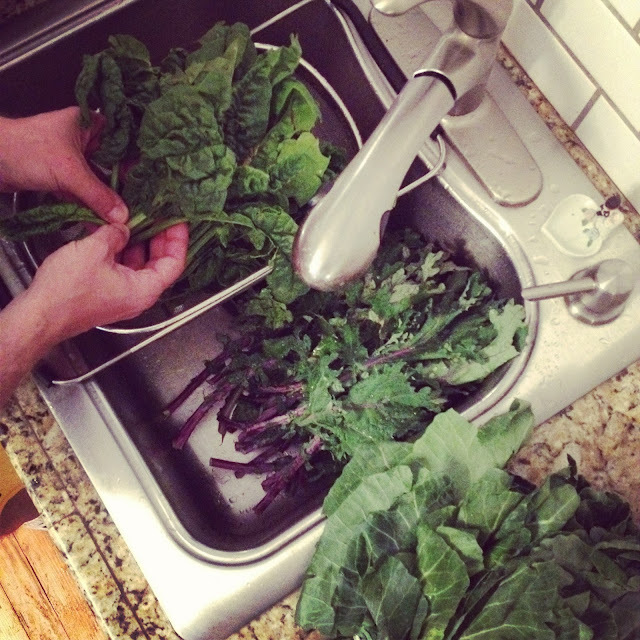 Upon opening the box, it was filled to the brim with huge and hearty greens — then nervousness set in on how we were going to store and prepare everything over the next week — that is, until Tim got home and got down to business. He first set aside all of the greens the trimmed down and washed the onions and garlic before placing them in zipper bags to store in our fridge. Once it came time for the greens, he gave each batch a heavy rinse and scrub, then neatly trimmed the stems and leaves again for storing in zipper bags that would stay fresh in the fridge. Taking the time to clean and prep everything like this was great since it's all ready for grab n' go style cooking or eating — no hassle later in the week. 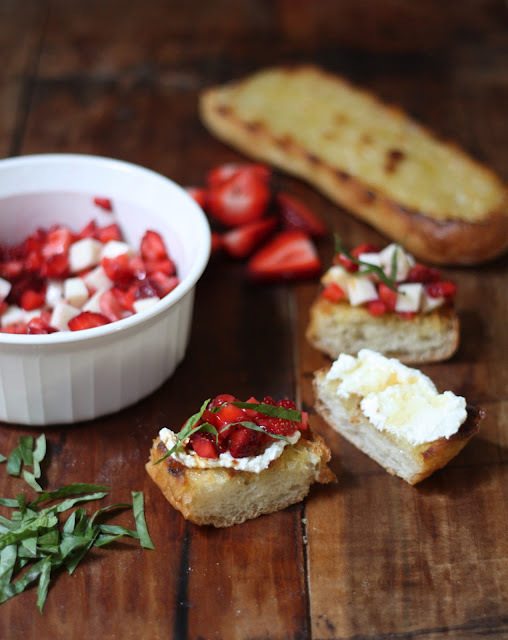 So far we've both really enjoyed having so much fresh fruit and vegetables on hand to incorporate into whatever we're cooking — it's been a really great excuse to push ourselves to eat even more healthfully (elephant garlic, anyone?). 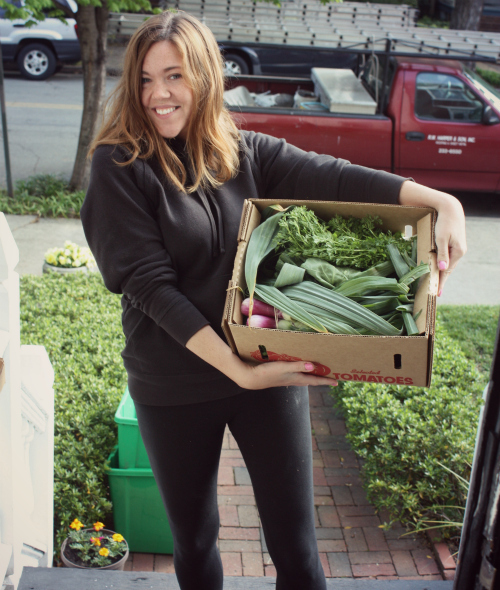 We'd love to hear what your experiences have been with CSA's or local produce delivery services in your area. If you're interested in learning more about The Farm Table box we're getting, learn more on the The Farm Table Facebook, Twitter, Blog, & Pinterest accounts. P.S. On a related food note, we are SO excited to learn that Richmond's food truck court experiment is out of beta mode and ready for bigtime! Dubbed the RVA Monster Rood Truck Rally, over a dozen of Richmond's food trucks are coming together under the management of GrowRVA every Tuesday and Friday night from 6-9pm right around the corner from us in the parking lot of the Virginia Historical Society! Full scoop here. Feeling very hungry right now! Love the colours in the Swiss Chard pic. I joined a CSA this spring and have discovered a love of leaves - all kinds of leaves. Since I also get a dozen eggs a week, my standby has become a greens frittata with whatever else is handy tossed in. My super favorite meal I've made was a kale, mushroom, and caramelized onion pizza - totally amazing. 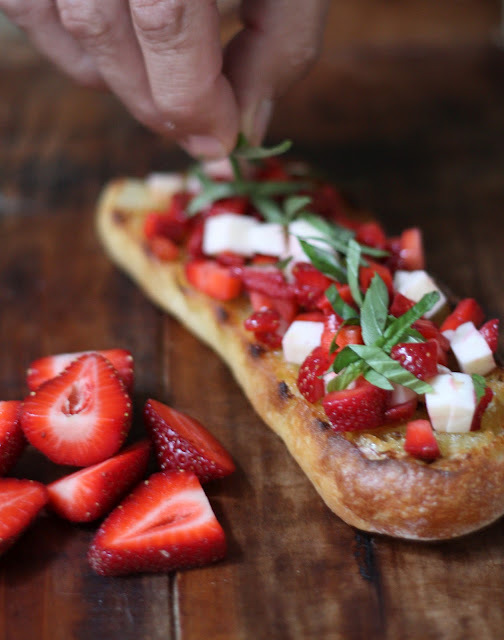 The pizza and frittata ideas are right up our alley — thanks for sharing! We just got our second box this week and are really enjoying the variety. We love farmboxes too! we used to get one maybe 6 months ago, but then finances got in the way :P. But now things have evened out and I'm kinda torn between the farmer's market and the farm box. Which do you like better? :) I like the way the farm box stretches you to cook odd things that you normally wouldn't eat though! We are just getting started so learning as we go! We still love the market and it definitely allows you to shop more on a whim. We agree that the box pushes you to eat and cook more creatively so we are still enjoying both at this point. Yummy...Love the colours in the Swiss Chard pic. Thanks so much for this post! I've been meaning to try this and now that I know how it goes I will definitely be signing up this year. Thanks again! Thanks Pauline! 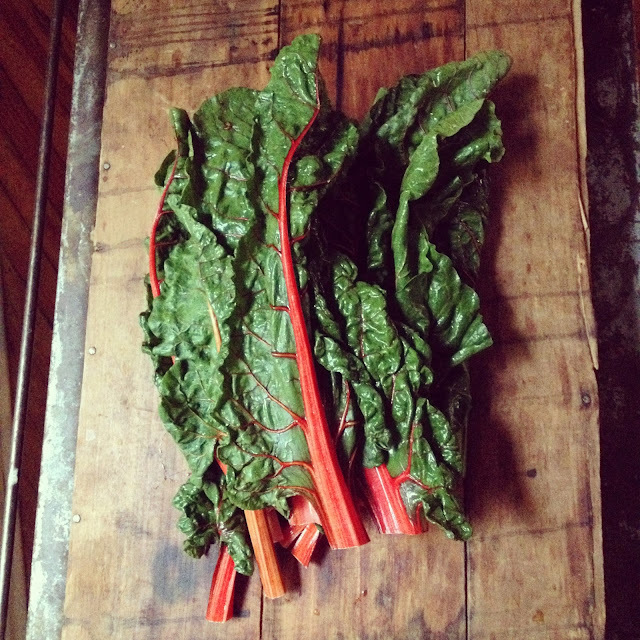 So glad you might try out the Farm Table deliveries or a type of CSA delivery! Makes for fresh veggies on hand at all times!